Superintendent out; enrollment down. | Look Out Scarborough! In December, Superintendent George Entwistle announced his “retirement” from the Scarborough school department as of the end of the school year. He was quite clear that he was not “resigning,” despite the fact that he apparently plans to continue working in some other capacity after leaving Scarborough. But that’s just a matter of semantics. We wish him well in his future endeavors and thank him for his dedication to Scarborough’s schools over the past five years. Negotiating the teachers’ contract. The contract, which will be effective September 1, 2016, is currently being negotiated (we assume). This contract will drive probably 30% or more of total school expenses for the next three years. It is likely the single most important driver of the school budget. Sorting out the ever-changing Federal and State curriculum and testing requirements. With “No Child Left Behind” now left behind for the “Every Student Succeeds Act,” many significant judgments and decisions will need to be made at the local level. Planning the programmatic and facility changes needed for adding Pre-K to the school system. The State is strongly encouraging all school systems to put pre-kindergarten in place for the school year beginning July 1, 2018. This will obviously require a multi-year planning process. Not to worry. The School Board has engaged a Marlborough, Massachusetts-based firm to undertake a national search for a new superintendent. The tab on that is around $15,000. But no problem… it turns out finding that cash won’t be an issue. Fortuitously, that amount is available in the current budget from funds left over after new teacher hires this fall, according to School Board Chair Donna Beeley, as reported in the Scarborough Leader. Isn’t that a happy coincidence! We wonder how much more is left over in the budget and available for another use. It would be nice if the schools’ quarterly financial reports were informative enough to allow everyone in Town to see how much of the current budget is left over or not really needed for its intended purpose. One of the search firm’s tasks is to form focus groups comprised of “professional staff, residents, business officials and elected or appointed leaders” who will help establish the profile of the candidate to be recruited as our next superintendent. As soon as we find out how you can volunteer to be in a focus group, we’ll pass that information on to our loyal readers. 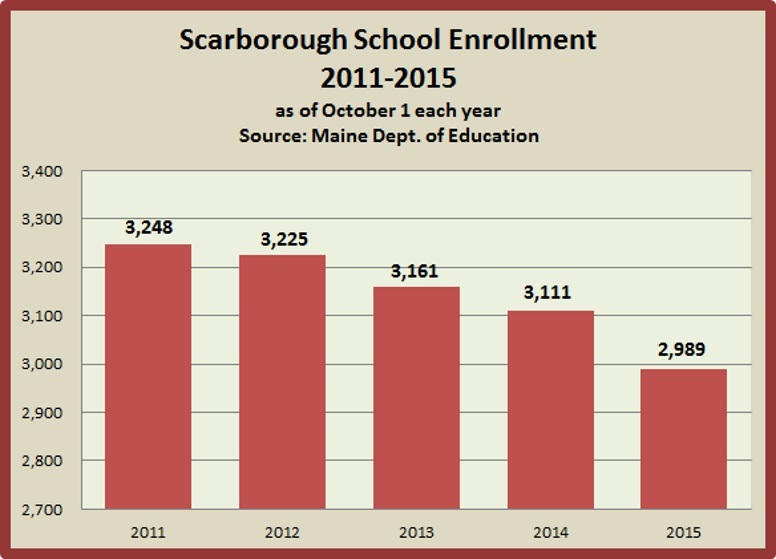 Data provided by the Maine Department of Education portrays a continuing — and deepening — slide in Scarborough’s school enrollment. As of October 1, 2015, DOE reports total school enrollment in Scarborough was 2,989. That’s down 122 students from 3,111 as of October 1, 2014. On a percentage basis, that’s a decrease of 3.9%. At the state level, total enrollment was down .6%. So Scarborough’s percentage decline was more than six times the State rate. Why does this matter to Scarborough taxpayers? Because enrollment is one of the two primary factors that are used to determine the amount of state education aid the Town receives (“General Purpose Aid” or GPA). If a town’s enrollment declines at a rate greater than the overall State rate, the town receives a smaller share of the State education aid pie. The other major factor that determines a town’s share of State education aid is the total valuation of the property in the town. The more a town’s valuation grows relative to the rest of the State, the smaller that town’s share of education aid. (This is based on the “take from the rich, give to the poor” system the State has in place for funding public education.) So since Scarborough is one of the fastest growing municipalities in the State, our valuation growth has reduced the relative amount of State education aid we have received in recent years. Thus both our enrollment decline and likely valuation increase point to lower State education aid in the budget for Fiscal 2017 (beginning July 1, 2016). You are forewarned! 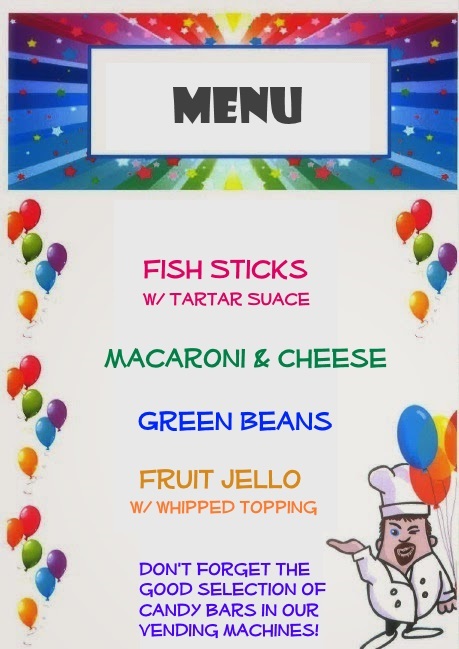 No such thing as a free (school) lunch? There have been many glowing reports of the improved cuisine in the Scarborough schools. Starting in 2015, we began “sharing” Cape Elizabeth’s food service director with them. (We pay 60% of his salary, Cape pays 40%.) We’re very pleased to hear that the kids are getting healthier, more nutritious meals. 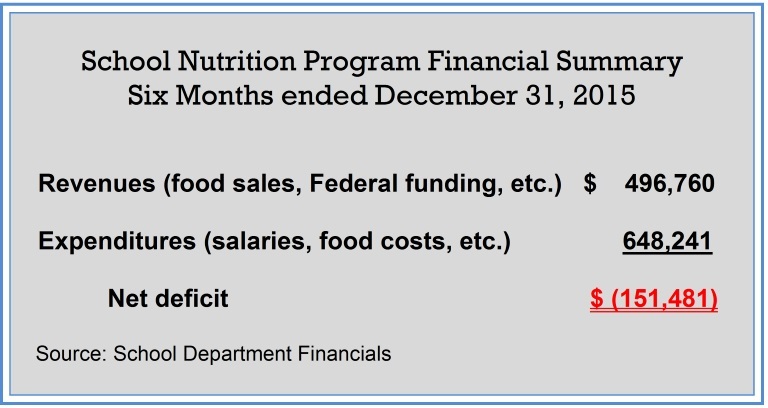 But we couldn’t help being a bit concerned about the potential additional costs associated with a more foodie-oriented lunch program. 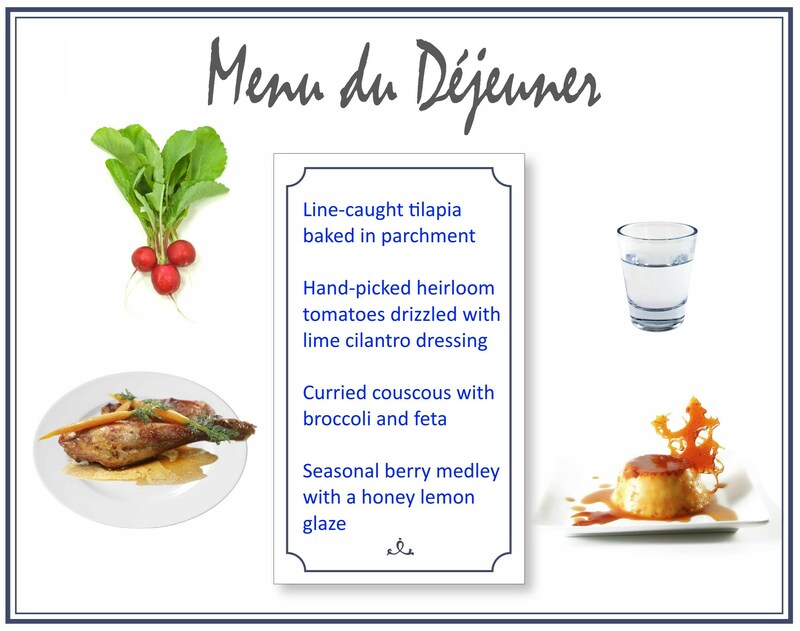 Whenever we see the words “locally-sourced” or “house-made” on a restaurant menu, we reflexively grab for our wallet and prepare for sticker shock when the bill arrives at the end of the meal. Faithful readers of this blog know that irony is one of our favorite things. Like when Winterfest has to be postponed because it’s too wintery. 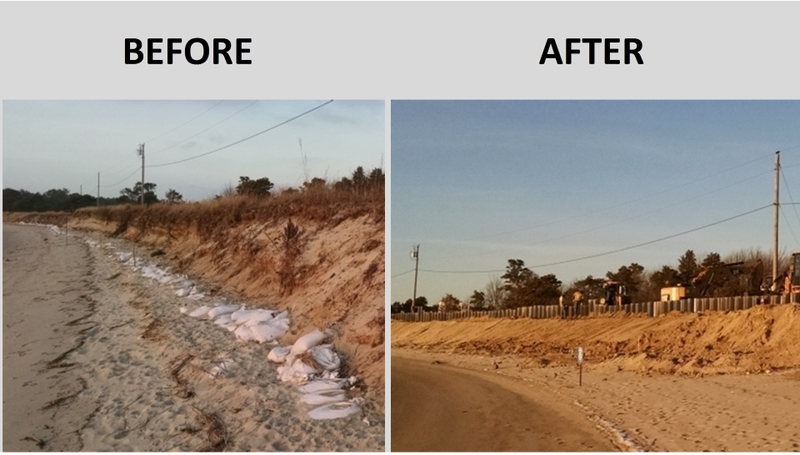 Well, irony will be front and center in our next issue as we tell the story of the dramatic changes made within the past month at the north end of Ferry Beach… along the edge of the Prouts Neck Country Club golf course, to be precise. You’ll laugh, you’ll cry, you’ll beg for more. Here are a couple of before-and-after images of this latest engineering marvel. All the details next time! That’s all for now. Happy trails until we meet again! This entry was posted in Uncategorized on January 19, 2016 by Site Author. Forgot to ask Why do we pay 60% and Cape 40% for food director? Thanks, Steve. Always enjoy your info and commentary. Thanks! The well of new material never seems to run dry… unfortunately. Another great issue. Looking forward to the next one!